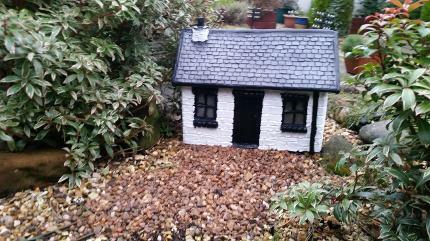 This countryside cottage model is a full building that comes painted with a multi-coloured brick effect as seen in the adjacent photo. 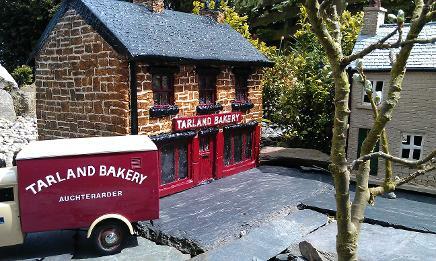 Please see more images of this model in our Buildings Gallery. 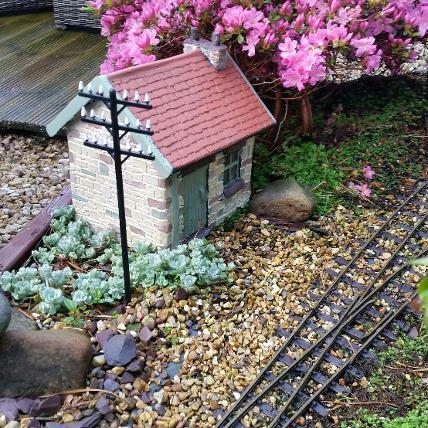 This building has been designed to represent an authentic British countryside station. Please see the gallery for more photos, including photos of the full station. Please note that the clock attached is also included with the station. 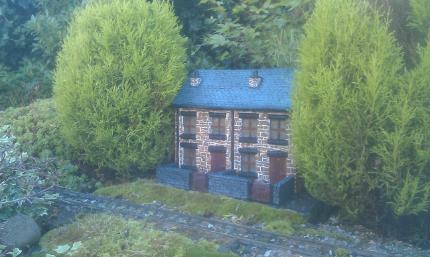 This croft cottage model is a full building that can come painted whitewashed or brick effect. 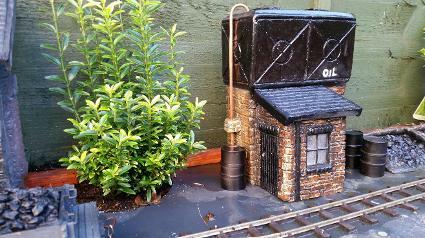 Painted Line Side Huts include full brick work painting. 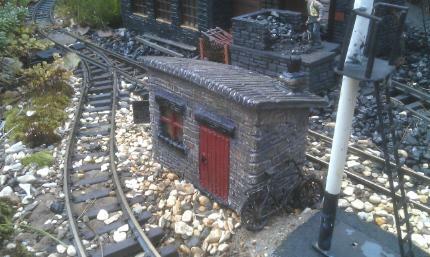 Line Side Hut Description: Sloping roof, window and door. 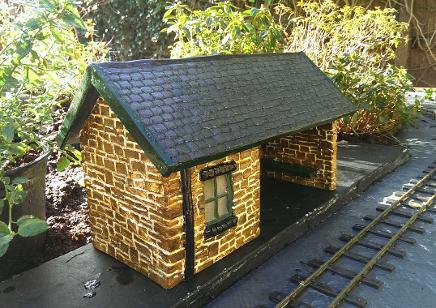 Line Side Hut Sizes APPROX: LENGTH = 6"/150mm . HEIGHT = 4"/100mm. WIDTH = 3"/75mm. 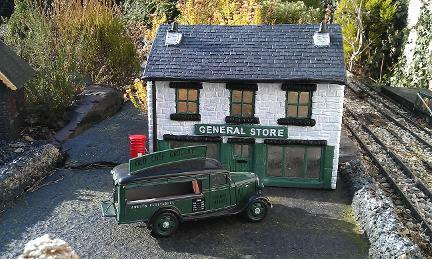 Painted Store/Shops include full brick work painting. NEW: Can now come in a white brick wash. LENGTH = 14"/355mm. HEIGHT = 11"/280mm. WIDTH = 4"/100mm. 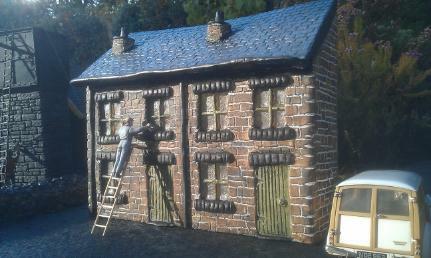 Half Relief Terraced House Sizes APPROX: LENGTH = 14"/355mm. HEIGHT = 11"/280mm. WIDTH = 4"/100mm. Can come in a white brick wash. The brown brick wash here was to match a previous customers other buildings. The windows are also tinted for authenticity's sake. The police blue is a new colour in our range, which can also be applied to houses and shops if requested. 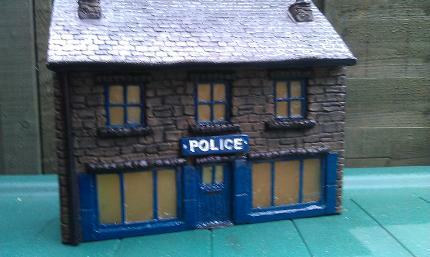 Police Station Sizes APPROX: LENGTH = 14"/355mm. HEIGHT = 11"/280mm. WIDTH = 4"/100mm. 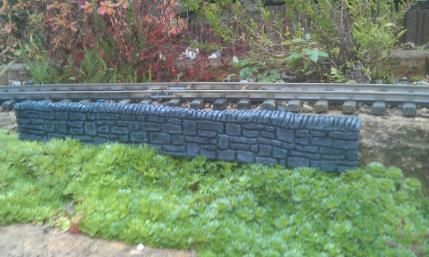 Wall Sections Sizes APPROX: LENGTH = 14"/360mm. HEIGHT = 50mm. WIDTH = 18mm. Oil Storage Tank Sizes APPROX: LENGTH = 8"/180mm. HEIGHT = 11"/260mm. WIDTH = 4"/100mm. Description: The Oil Storage Tank features a copper filling pipe on one side and on the other side there is a copper draining pipe that can be connected to a barrel. 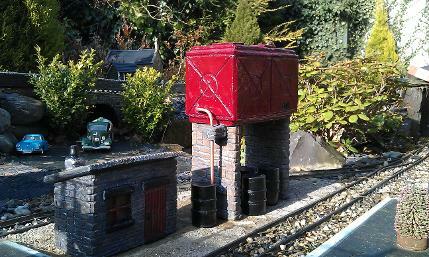 Please note that three barrels are included with the Oil Storage Tank, and more barrels can be purchased seperately for £3 each (Barrels come in black). Please view the buildings gallery section to observe more shots of the Oil Storage Tank from various perspectives. Oil Storage Tank with Office Extension: This version of the oil tank is no longer supported by just two legs, instead featuring a solid base all-round. 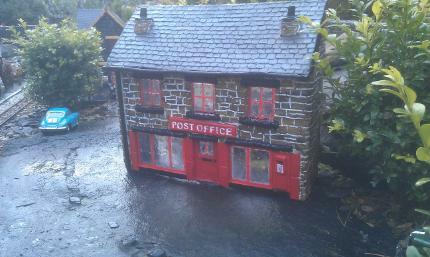 It has a small office attached, with one door (100mm) and two windows. It also comes with three oil barrells. This item costs £75. More photos can be found in the gallery. Water Tower: The water tower can be painted in any colour you desire. 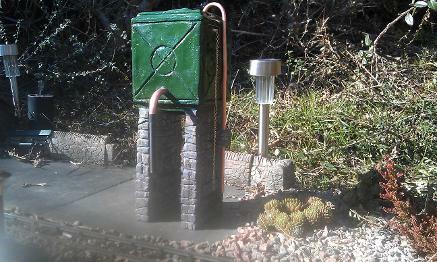 The water tower tank costs £50. Water Tower Sizes APPROX: LENGTH = 4"/90mm. HEIGHT = 11"/260mm. WIDTH = 4"/100mm. Description: The water tower storage tank features a copper refilling pipe on the side of the tower and, at the front of the tower, there is a copper/rubber water refuelling pipe. There is also a brass chain hanging on the side of the tower. 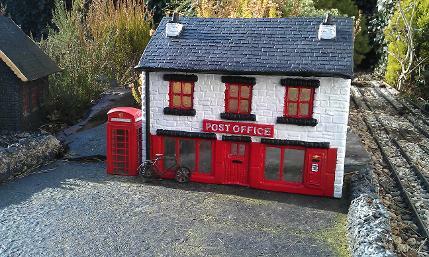 Full House/Shop: Can come in a brick or white wash. Name and colour can be edited to match your request. 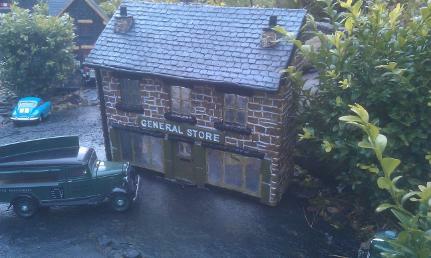 Description: Shop side of the building features clear resin for the window effect. The house side features tinted resin. 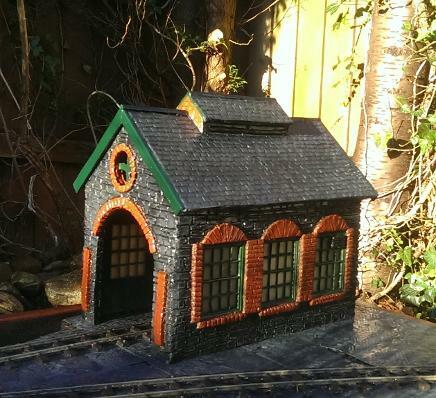 Engine Shed: The engine shed is based on British narrow-gauge engine sheds. It can come open-ended at both sides (e.g an entrance and exit straight through), or it can be open-ended at only one side (e.g only a single entrance and exit). Please refer to gallery photographs. 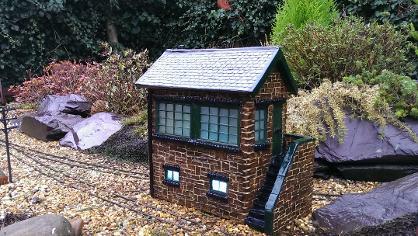 Signal Box: The signal box is based on British narrow-gauge. Please refer to gallery photographs for a closer look. Waiting Room Halt: Can come in a whitewash, with a black door and window frames. Please refer to gallery photographs for more details. 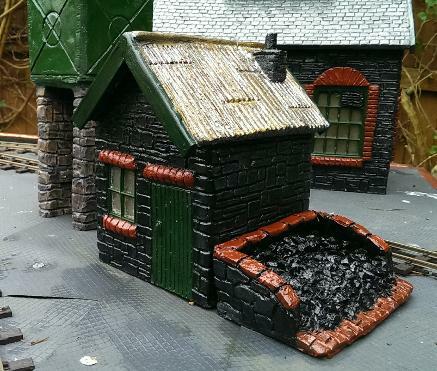 The coal office can come with a choice of tiled slate or corrigated roofing. It features a side and front window, and a door. 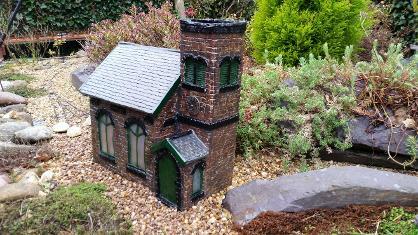 The church model has been designed to authentically represent a traditional British church. It has church themed windows and a clock above the main door, which is attached to the bell tower. Please see the buildings gallery for more. 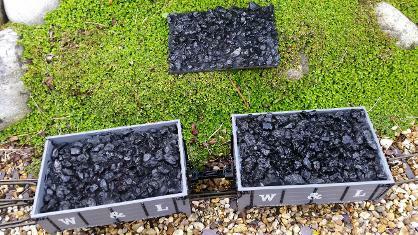 The resin coal section snuggly fits into Accucraft Open Wagons, and it comes completely painted. We recommend that you use clear silicone sealant to fix it into position.